Chanterelle mushroom beer brewing techniques. Chanterelles have a delicate, fruity, apricot bouquet with a smooth texture that complements German wheat type beers. Use around 60 grams per liter of beer. Adjust the amount to get the flavor you want. The chanterelle cap grows up to 13 cm wide with an edge that rolls inwards. It can mature into a funnel shape with wavy edges. It is the color of a golden egg yolk and it can range into an orangey yellow with whitish yellowy flesh. The gills are blunt ridges the same color as the cap. The stem is cream in color and is as wide as the mushroom. 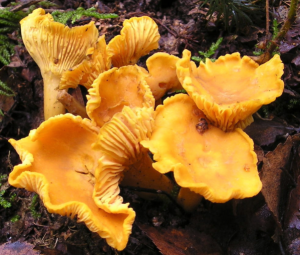 Chanterelles love shade, organic matter and temperate, moist temperatures. They are tree lovers so are found growing around oaks, birch trees, balsam firs, spruce and hemlock trees. You can also find them around blueberry bushes and poison ivy. Look for them close to natural watercourses and in low-lying damp environments. These do not make a good type of mushroom to grow at home. This is because of the reliance on trees and the forest environment to grow. But it is easy to find them if you understand the chanterelle’s growth environment. They grow in the grass or among leaf litter left lying around treed areas. The do not grow on trees or any type of wood. Chanterelle mushroom for brewing. Usually autumn is the best chanterelle hunting season but you can find them in the wild from May to October. Simply gently twist and pull these mushrooms from the soil to pick them. Chanterelle mushroom beer is perfect as a daily drink. Chanterelle Ale is one of my favourite beers. It ferments quickly and is ready to drink in just over a month. Subtle fruitiness that’s not overpowering hat complex makes this a wonder beer with dinner. In the evenings after eating you may wish for a shot of Chanterelle Schnapps to help digestion before bed.